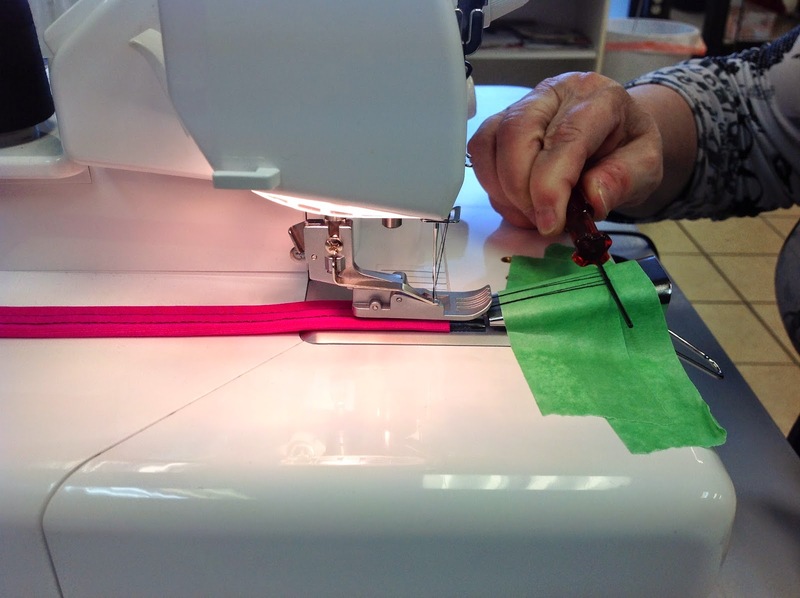 In my cover stitch class, I often hear women say they have owned a machine for years, but it hasn’t been out of the box! Are we intimidated by this funny looking machine? Often, we don’t get lessons on the machine when we buy it. Or we get a quick lesson on how to thread it and make it go, but not how to really do anything. Does that sound familiar? One of the most frustrating things is to finish a hem, then pull what looks like a loose thread, and then disaster happens. If the final stitches in the row are not dealt with, the whole hem will unravel (oooh… yes, it will!) Then you and that machine will lock horns! let me share with you my tried and true method to lock stitches, not horns! Some machine manuals suggest for you to always overstitch the stitches. What’s overstitching? That’s when you stitch one side seam on a T-shirt, for example, then cover stitch the bottom hem, and then serge the other side seam after. This overstitches the ends of the cover stitch, catching the thread ends in the serged seam. It is easy to do, and can be ok for some things but to me, it is not very professional looking. 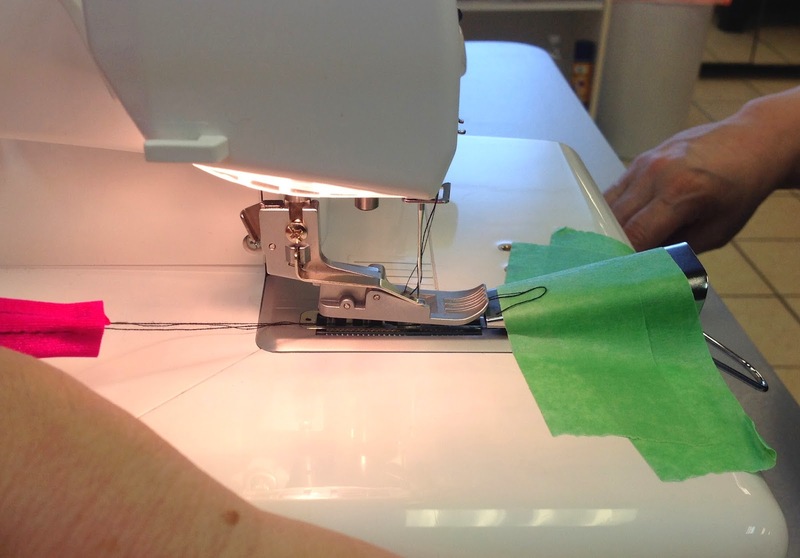 It is much better to do a hem in the round.Sew the side seams first, then do the hem. Makes sense, right? When you stitch to the end of the fabric, stop stitching and raise the needles to the highest position. Next, raise the presser foot lifter. This will dis-engage the tension discs and allow the threads to be pulled easily. Hopefully you can see below that the foot is lifted! Now insert some kind of small, thin tool, such as a bamboo stick, a thin awl or the small Allen screwdriver that is packaged with some machines, and use it to go under the foot. Whatever you use, has to be thin enough to fit between the foot and the fabric. Pull the threads forward until you can see that there are two threads wrapped over the Allen key. Those are your needle threads. When you have pulled the threads out a few inches, cut them, so there are now 4 thread tails. 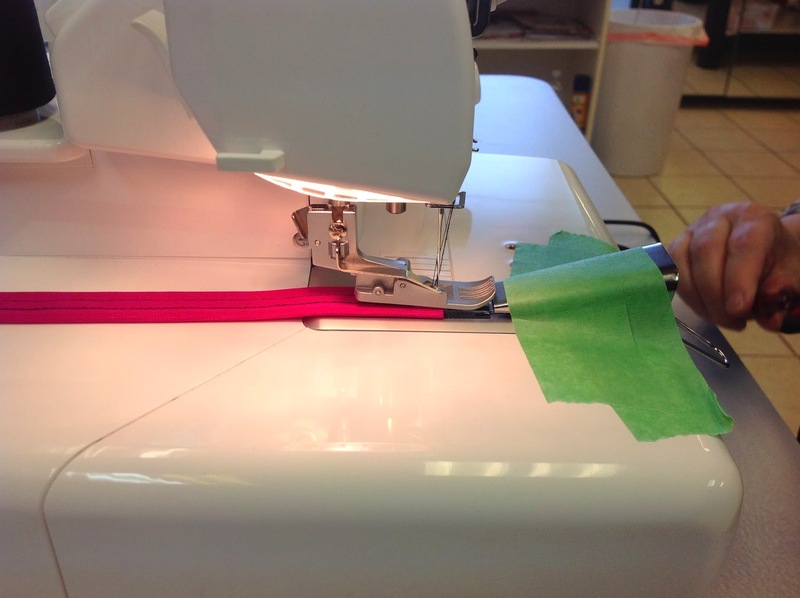 Pull the fabric toward the back of the machine. 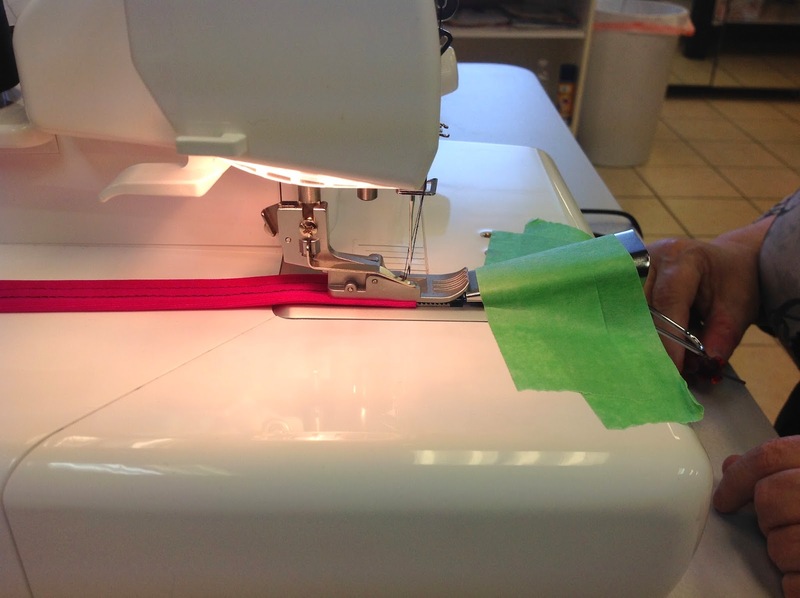 The bottom thread is still attached but the top threads will automatically pulled to the back side of the work. Cut the bottom thread. The stitching is now locked and the machine threads are in position for you to start again. 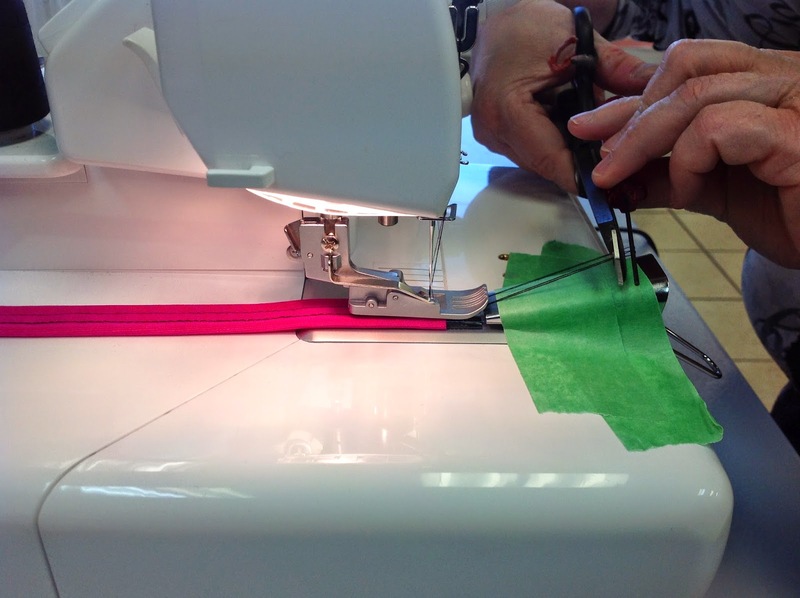 Whether you sew a straight run of stitching, such as shown here on the straps, or stitch in the round on a hem, you should lock the stitches exactly the same way. A cover stitch machine can do these wonderful, professional looking hems – try this stitch locking technique in your next project so you lock stitches, not horns! Yellow Polka Dot Bikini - Bottoms Up! Experience, Alyssa…experience! That's how I know all the things that can go wrong! I know a lot of women buy the combo serger and cover stitch, and I have one in the shop (the BabyLock Evolution) but I still like a dedicated machine, so I can leave it set up all the time. Thanks Bev-this is good for me to know, as I am still getting the hang of my serger, which has a cover stitch on it. After all of my fear of sergers, now I love the damn thing, but have a bit f a hard time picking the right stitch for the right purpose and locking it I couldn't never understand without getting all tangled up! Wow, you make it so much more understandable then reading a manual , I could have used you talent many times, thanks ! Nope…pull the fabric toward the back. The bottom thread is still attached, but it is the actual of pulling to the rear of the machine that causes the top threads to pull through to the back of the fabric. Only then do you cut the bottom thread. 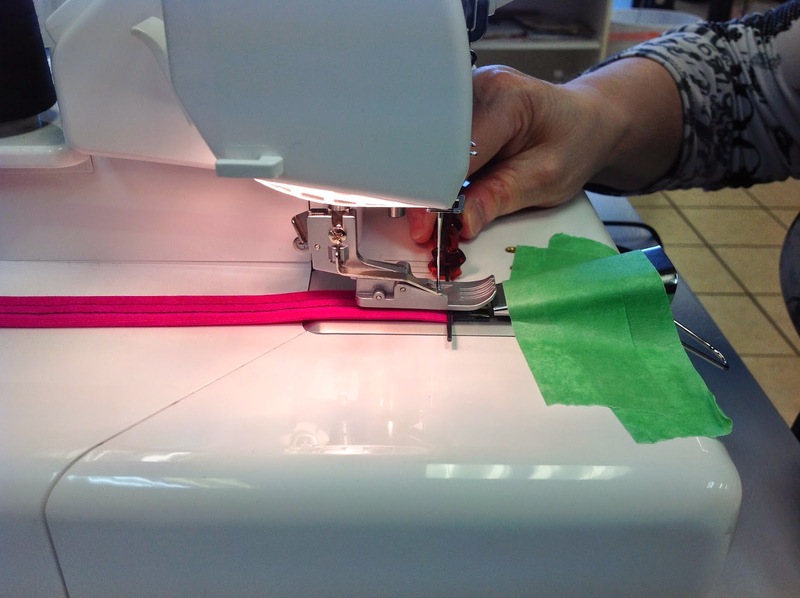 If you just cut the threads at the end of the seam (like you would on a regular sewing machine), the seam will unravel. Ask me how I know that…lol. Bev…just wondering…..you say "Pull the FABRIC" toward the back of the machine. The bottom thread is still attached but the top threads will automatically pulled to the back side of the work. Don't you mean pull the THREADS? If you pull the fabric, you are pulling it out from under the presser foot-am I misunderstanding something?